The gardens of Gajah Air (in Bahasa for water elephant) derives its name from the magnificent view of a nearby island looking like a submerged elephant in the sea. 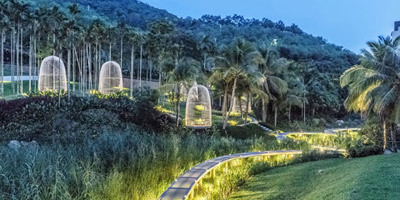 The landscape is conceptualized as a hidden paradise away from the urban metropolis on Hong Kong island where flora and fauna flourishes in the wild. The austere planting palette in the forecourt belies the full blossom of a garden facing the panoramic sea and verdant forest at the back. A deliberate contrast ensues in its experiential narrative between the closed view of the former and the expansive borrowed vistas of the latter. The use of local materials and traditional graphic motifs make for a modern contextual reference to times gone by in the local village. These patterns feature from laser cut environmental signage to handmade off form concrete stepping stones, echoing eccentric filigree in the interiors. 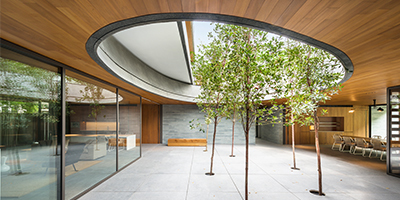 This modern retreat in a rural environs comes fully designed with a spiral stairs to the rooftop, reflecting pool, fireplace and custom-made barbeque pit.